Today Jonathan and I went to our appointment at the perinatologist's office. 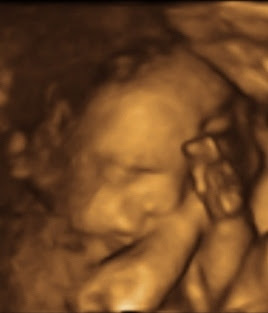 We had a level II ultrasound which looked at Baby G's body and his heart. 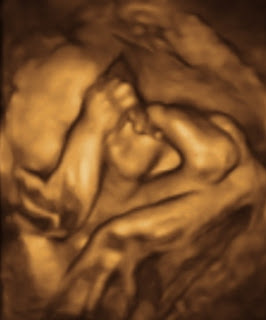 The ultrasound itself was wonderful to be able to see our little boy again and the technician gave us several 3D pictures to take home. During the ultrasound, the technician noticed that Baby G was still experiencing an arrhythmia. When the doctor came in, she double-checked the results and confirmed that Baby G is experiencing heart murmurs every 20-50 beats. The unusual part of the murmurs is that they are occurring with one immediately following the other before going back to a normal sinus rhythm. 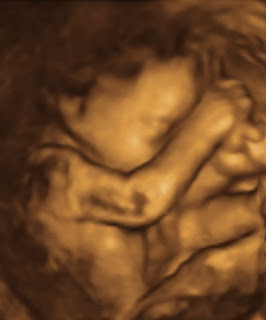 The doctor recommended going in for the fetal echo examination, which is scheduled for October 20. The fetal echo will determine the next course of action. Right now, it looks as though Baby G is experiencing one of two conditions: premature atrial contraction (PAC) or premature ventricular contraction (PVC). If he is experiencing PAC, then we will continue to monitor his heartbeat through regular appointments with our OB every two weeks. If Baby G is experiencing PVC, then we will be following-up with the perinatologist for weekly ultrasound appointments to monitor his heart. The good news is that Baby G will likely outgrow this condition without problems, but the doctors agree that it needs to be monitored to ensure that it doesn't become worse or cause any other problems. Jonathan and I were thrilled to hear that this is likely a temporary condition and that Baby G will probably be fine, but I think we'll both feel better after the appointment later this month when we know more. Again, thank you to all of you who have been thinking and praying for us. It truly means so much to us!